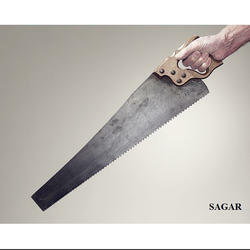 We are a unique name in the industry to provide our prestigious clients an exclusive range of Hand Saw Machine. Keeping in mind the diverse requirements of our clients we are offering an extensive range of Plastic Handle Saw. These are manufactured by our vendors with the help of premium quality material and advanced technology in compliance with set industrial norms. These are easy to handle and are available in various specifications. (a) Manufactured from hardened and tempered High Carbon Steel strip. Used manually by applying Straight Vertical Handles on the sides of the blade (Kunda can be provided for the Handle Attachment). (b) Available in Bright, Black and Satin Finish. Working: For cutting small Logs. Length: 4 to 8feet with half footgap.